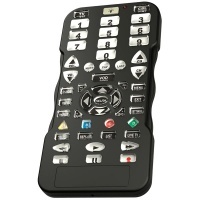 Large and easy-to-use remote controls for individuals with low vision. Watching TV can quickly become a whole lot less enjoyable when you can't read the tiny print on the small buttons. This oversized, easy-to-view remote is ideal for the visually impaired because of its extra-large design, 5-1/2 wide size and huge push-buttons. The illuminated 3/4-inch push-button controls are three times the size of standard remote controls. This universal remote is compatible with most electronic items and can be programmed to operate your VCR, TV, DVD, Dish Satellites and Cable Box. Uses 4AA batteries (not included). Measures 5-1/2 in. W x 8-1/2 in. L x 2-1/2 in. H.
Designed to provide maximum ease and enjoyment watching TV, this Simplicity Universal Cable and TV Remote Control has large backlit buttons for easy navigation, is simple to program, and is comfortable to hold with its molded side grips and carry strap. Great for those with low vision and dexterity challenges, as well as anyone who doesn't want the complexity, clutter and confusion of typical 5-device remotes. This remote provides a larger size and the ease of controlling only 2 devices. - Two Easy-to-Program Methods: 1. Point & Press (auto scan) programming allows programming of your devices without knowing codes - just "point and press". 2. Continuous Code Entry programming. Enter multiple set-up codes in programming mode, allowing faster set-up. Easy set up in 4 steps. No codes to program. Now Compatible with Cable Boxes and Satellite Receivers! 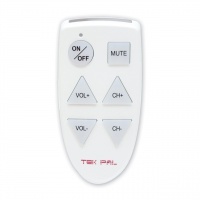 Designed to make life simpler and better for all, the Tek Pal TV Remote is especially helpful for the blind and those with low vision. The visually impaired will love the convenience of it's large, clearly labelled lighted buttons. 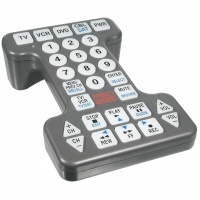 This remote is now compatible with cable boxes and satellite receivers in addition to the TV! Only 6 buttons operate all television functions. Buttons have different sizes and shapes for ease of identification and use. The ON-OFF button is circular with a diameter of more than 3/4". The MUTE button is a 3/4" square. The VOLUME UP, VOLUME DOWN, CHANNEL UP and CHANNEL DOWN buttons are triangles measuring 1" on each side. Ergonomically shaped remote tapers off at rounded bottom for comfortable feel in your hand. 5.5" long by 2.75" wide by 1" thick. Uses 2 AA batteries (not included.) Warranty: 1 year.